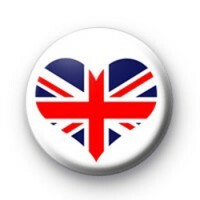 Union Jack love heart button badge in white with a love heart made up of the red, white & blue of the union jack. These badges are very patriotic and perfect for national events such as the queens birthdays, royal anniversaries and royal weddings, not to mention the birth of a new royal baby. If you are a royalist or just love the United Kingdom of Great Britain & Northern Ireland, we have plenty of badges for you. Also great for a bit of British nostalgia. 25mm button badge made by hand in our workshop.